Khrimian Hayrig remains one of the most popular names in the history of the Armenian Church, as shown by the use of the endearing name hayrig (“papa”) along his name. Mgrdich Khrimian was born in the Aikestan quarter of Van on April 4, 1820. He lost his father at an early age and was brought up by his uncle, a merchant. He was educated at the parochial schools of the islands of Lim and Gduts in Lake Van and the monastery of Varak, where he studied Classical Armenian. In 1842, after returning to Van, he embarked on a journey across the region and made a pilgrimage to Holy Etchmiadzin. From 1844 to 1846, Khrimian lived in Constantinople, where he made connections with Armenian intellectuals. In 1846 he returned to Van and married Mariam Sevikian. In 1847 he visited Persia and the Russian Caucasus, and sojourned in Alexandropol (today Gyumri) for six months. He moved again to Constantinople and lived there until 1853, teaching at an all-girl school in the quarter of Hasköy. He published his first books in 1850 and 1851. Khrimian returned to Van in 1853, but finding that his mother, wife, and daughter had all died, he decided to enter the Armenian Church. He was ordained vartabed at the Cathedral of Aghtamar in 1854 and appointed dean of a church in Scutari, near Constantinople, a year later. He started publishing the periodical Artsiv Vaspurakan. He returned to Van in 1857 and established a seminary at the monastery of Varak. He founded a publishing house there and resumed the publication of Artsiv Vaspurakan (1859-1864). In 1862 he was appointed abbot of the famous monastery of Surp Garabed near Mush. He was instrumental in the foundation of a school and a journal there, called Artsvik Tarono, and transformed the monastery into a flourishing center. In those years, he earned the name of Hayrig. Ordained as a bishop in Etchmiadzin (1868), Khrimian was elected Armenian Patriarch of Constantinople in September 1869. He cleared the patriarchate's debt and sought to increase the provincial representation in the Armenian National Assembly. He presented a detailed report to the Ottoman government documenting instances of oppression, persecution, and miscarriage of justice in the Armenian provinces. He used the position to advance the interests and conditions of Armenians in the provinces. His outspokenness annoyed not only the Ottoman authorities, but some of the Armenian wealthy elite as well. The government compelled him to resign in 1873. Afterwards, Khrimian dedicated his time to literary pursuits until 1878 (he published four books from 1876-1878), when he led the Armenian delegation at the Congress of Berlin. The delegation's memorandum to the great powers concerning the implementation of reforms in the Armenian provinces was dismissed, and the Treaty of Berlin, signed in July 1878, failed to force the Ottoman government to implement real reforms. After returning to Constantinople, Khrimian delivered a well-known sermon in which he called Armenians to use arms to win over their rights. He told his flock that Armenians, unlike the Christians in the Balkans, had not won autonomy because “no Armenian blood had been shed in the cause of freedom.” Famous for its allegories, such as the analogy of a ladle and cauldron with the sword and freedom, the sermon is considered one of the forerunners of the Armenian revolutionary movement. After his return from Europe, Khrimian was appointed Prelate of Van in 1879. He opened new schools, including the first agricultural school in Armenian lands. In the 1880s he supported the Armenian secret societies devoted to the cause of national liberation. The Ottoman government, which looked unfavorably on his activities, suspended him in 1885 and had him sent back to Constantinople. Following the Kum Kapu demonstration of July 15, 1890, four representatives of the Armenian National Assembly, including Khrimian, issued a report criticizing the government for the treatment of the Armenian peasantry. Khrimian was exiled to Jerusalem in December 1890 and lived in the St. James monastery of the city’s Armenian Quarter. On May 5, 1892, Khrimian was unanimously elected Catholicos of All Armenians. Sultan Abdul Hamid II initially did not allow him to travel to Etchmiadzin. He was granted permission to travel, only if he did not set foot in Turkey, after Russian emperor Alexander III’s request. He was finally enthroned as Catholicos Mgrdich I in September 1893. He had his Ottoman citizenship revoked and became a Russian subject. During the Hamidian massacres of 1894–96, Khrimian provided material assistance to the Armenian refugees. He also implemented the renovation of many ancient monasteries and churches. He collaborated with the Armenian Revolution Federation to organize mass demonstrations against the June 1903 edict of the Russian government that closed down Armenian schools and confiscated the properties of the Armenian Church. Popular resistance led to the revocation of the edict in August 1905. 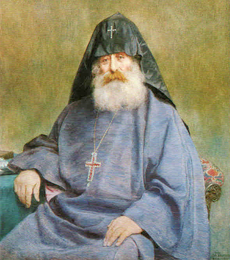 Catholicos Khrimian remained active until the end of his life, on October 29, 1907. He was buried in the courtyard of Holy Etchmiadzin. He was revered for his progressive and nationalist views. A school in Yerevan founded by him in 1906 and renamed for the 26 Baku Commissars during the Soviet period was renamed after Khrimian in 1989. A school in Buenos Aires (Argentina) has carried his name since 1930.